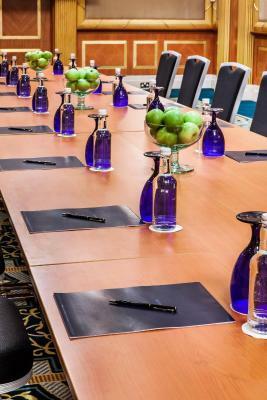 The staff were extremely friendly and helpful, namely the ladies at the front office (Dina & Inee) who have assisted me with: check in of my family members before my arrival; sorting out my hilton honours account which i misplaced; and my late checkout. The location is serene, I wish now i spent more time in the AL DALLAH lounge. 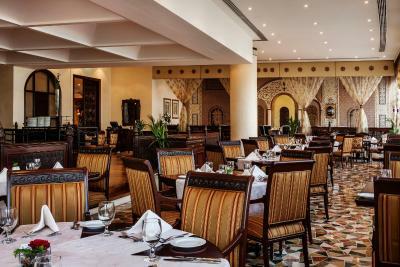 Excellent place, I liked the aminities, the breakfast buffet was awesome, a variety of authentic Mediterranean food, very nice staff, helpful and welcoming. I’ll do it again if I got the chance. The property met our expectations, however, it was the friendly and professional staff serving us during breakfast each morning at the restaurant that was excellent. Our server, Joshna, in particular was outstanding with her attention to my 2-year old daughter, service and care she provided. It was top-notch. I would return to this property just because of her and the colleagues she works with. Wonderful staff! 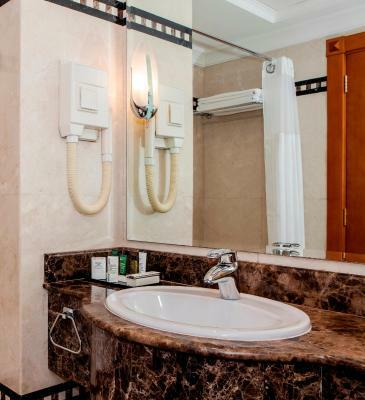 Hilton Sharjah This rating is a reflection of how the property compares to the industry standard when it comes to price, facilities and services available. It's based on a self-evaluation by the property. Use this rating to help choose your stay! 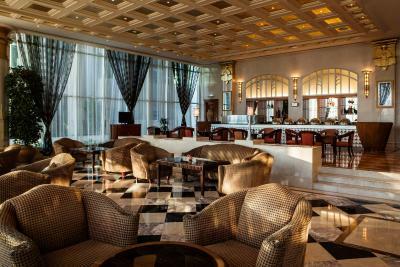 On the banks of Sharjahs’ Khalid Lagoon, Hilton Sharjah is a 5-star hotel that features spacious rooms with views of the lagoon or Sharjah. Free on-site private parking is also available. 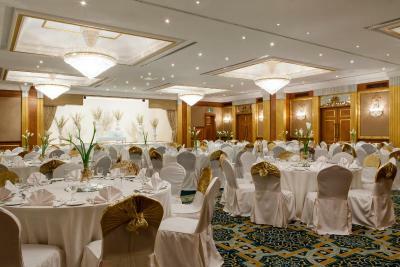 The air-conditioned rooms at Hilton Sharjah feature modern, elegant décor. Each has a flat-screen TV and a private bathroom with toiletries. 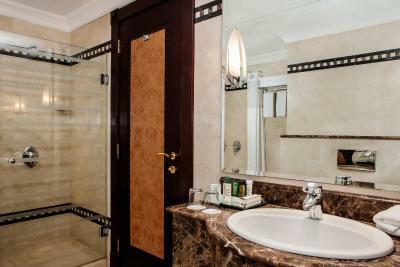 Interconnecting rooms are available in the Deluxe Rooms and Suites. Buffet-style breakfasts and dinners are served at Mojo All Day Dining Restaurant, and authentic Iranian cuisine is served at Shiraz Restaurant. 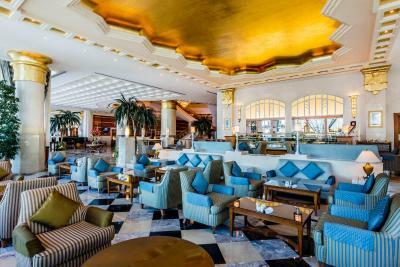 Guests can enjoy exotic cocktails in the lobby lounge. 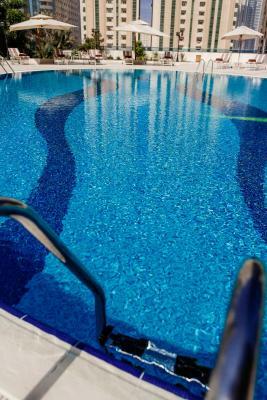 Hilton Sharjah has 2 temperature-controlled outdoor pools and steam rooms for men and women. 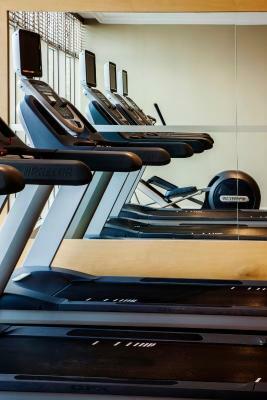 Guests can also play a game of racquetball or work out in the gym. 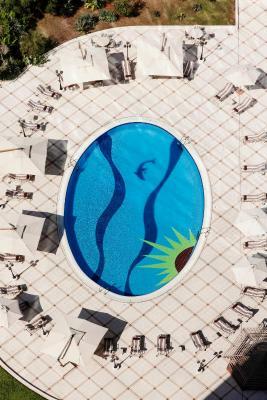 There is a separate children’s pool. 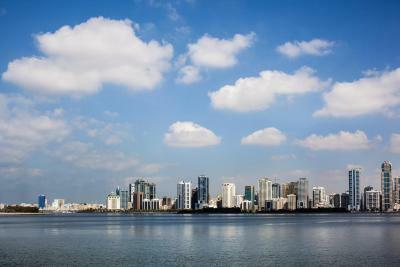 Central Sharjah is just 10 minutes by car from teh hotel. 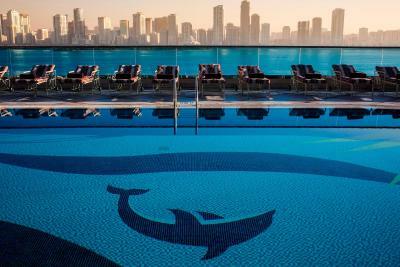 Dubai International Airport is a 20-minute drive from Hilton Sharjah. 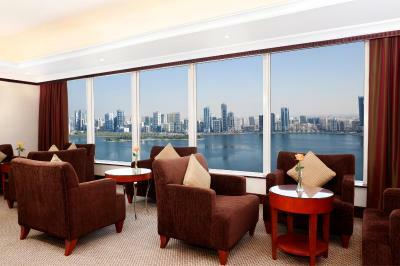 When would you like to stay at Hilton Sharjah? 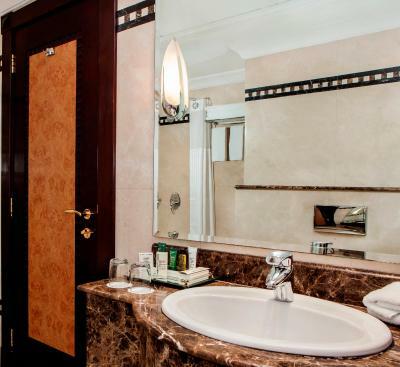 This room includes a flat-screen satellite TV, a minibar and a private bathroom. 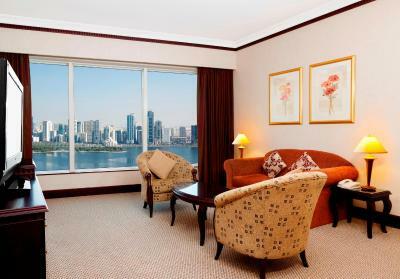 Featuring views of the waters of Khalid Lagoon or the city skyline of Sharjah, this spacious suite includes a seating area with a flat-screen satellite TV, a mini-bar and a private bathroom. 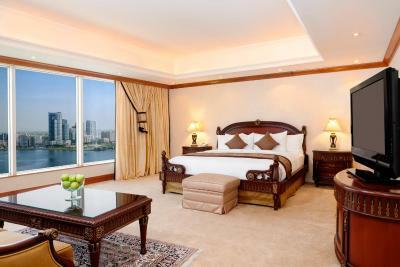 On one of the top three floors of the hotel, this room features views of the waters of the Khalid Lagoon or the city skyline of Sharjah. It includes a flat-screen satellite TV, a mini-bar and a private bathroom. 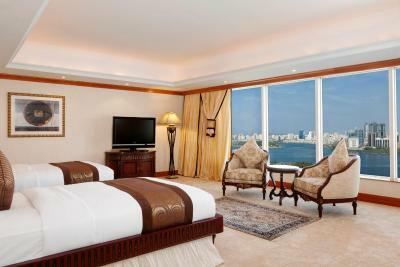 On a top floor, this extra spacious suite features views of the waters of Khalid Lagoon and Sharjah. It includes a seating area with a flat-screen satellite TV and a private bathroom. 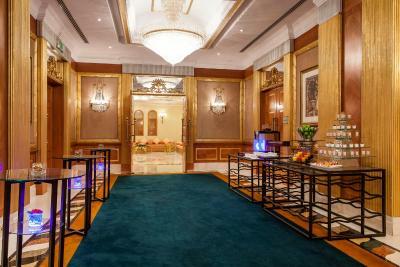 This room offers access to the Executive lounge. 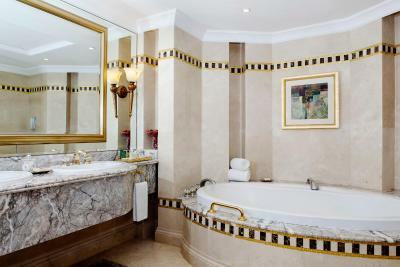 This spacious room has a flat-screen satellite TV, a minibar and a private bathroom. 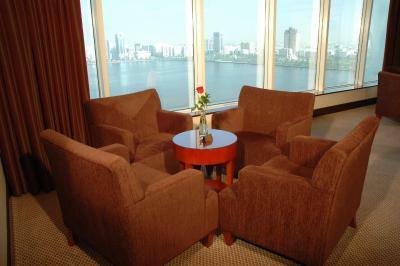 Offering views of the Khalid Lagoon or Sharjah City, this room is on the top three floors. It features a desk, a flat-screen TV and high-speed internet access. The bathroom is equipped with free toiletries. It includes Executive lounge access. Offering views of the Sharjah City Skyline, this air-conditioned room features a double room, a desk, high-speed internet access and a private bathroom. Has views of the Sharjah City Skyline, this air-conditioned room has a twin room, a desk, high-speed internet access and a private bathroom. 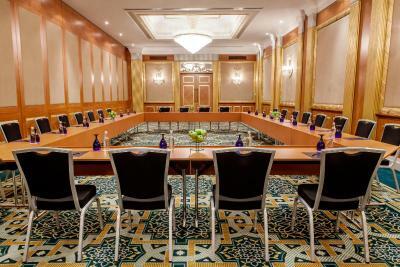 Hilton Sharjah, 5* located on Khalid Lagoon overlooking Al Mazaj Waterfront and Amphitheatre, minutes away from Sharjah City Centre and only 15 minutes from Dubai Airport, the property offer 259 rooms, 5 Food & Beverage outlets and state of art ballroom seating up to 500 delegates. 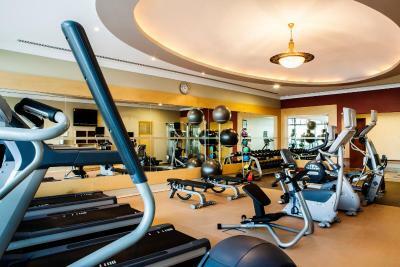 It features spacious bedrooms and a fantastic recreational facilities to unwind your day or week. 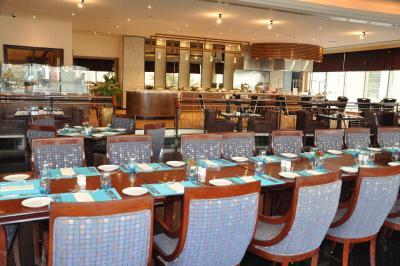 Our mission is to fill Sharjah with Light & Warmth of hospitality. 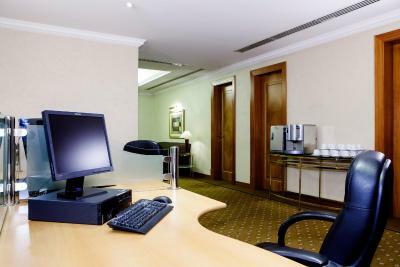 Wired internet is available in the hotel rooms and costs AED 50 per hour. 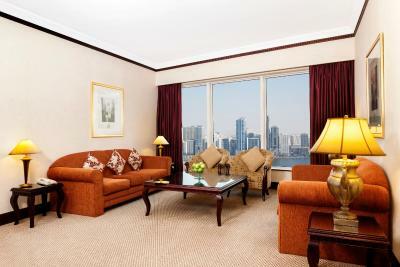 Wired internet is available in the hotel rooms and costs AED 100 per 24 hours. 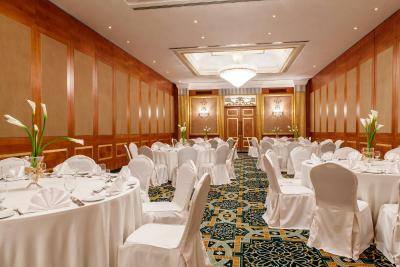 House Rules Hilton Sharjah takes special requests – add in the next step! Hilton Sharjah accepts these cards and reserves the right to temporarily hold an amount prior to arrival. That there was No kind of juice in Executive Lounge! The furniture is old, There is no TV guide was available and most TV channels are not working. The breakfast sections are limited. The breakfast dishes were limited. The breakfast..liked the variety ! Staff very friendly..helpfull and eager to please. The staff at reception.. especially Rezwaan was exceptionally helpful.